Savannah Goebel with Mean Sophia, who is entered in the Keeneland April 2-Year-Olds In Training And Horses Of Racing Age Sale. Most 2-year-olds headed to auction in the spring have a fairly conventional method of doing so: Train up to the under-tack show, breeze under the clock for a furlong or two, go through the sale ring, and prepare for a debut start later in the year. In contrast, Mean Sophia's path to the Keeneland April 2-Year-Olds In Training And Horses Of Racing Age Sale makes her an entirely different animal. 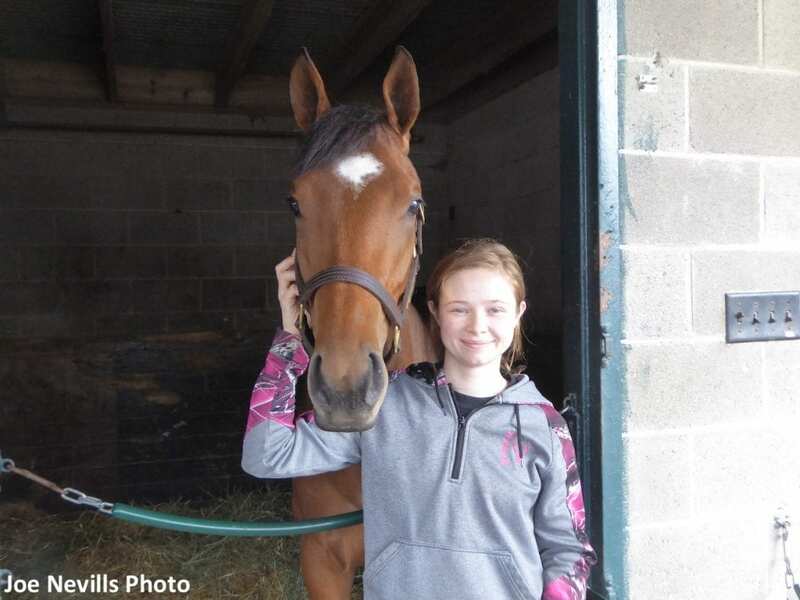 Within the span of six days, the Smarty Jones filly has gone from an unraced 2-year-old, to a 10 1/2-length maiden winner, to a highly sought-after supplemental entry in the Keeneland April sale, to a potentially lucrative return on investment for owner Savannah Goebel on the first horse she's ever owned. Keeneland traditionally kicks off its spring meet with a 4 1/2-furlong maiden race for 2-year-olds, and Mean Sophia broke from the second post in a full field in last Thursday's opener. Goebel knew it was an ambitious spot for the filly, who doesn't turn 2 years old on the traditional calendar until May 15, but having broken and galloped the filly, she knew what she had under her. A bullet work on March 22 at The Thoroughbred Center confirmed her suspicion the filly was ready for the racetrack. “We went to the gate the first few times, and she took on quick,” Goebel said. “She started to love it. By the third break, she wanted to go, and I knew she was going to be good. Goebel and trainer Cirilo Gorostieta had looked over the program and kept their expectations realistic. Third place money in a race with a $60,000 purse would have paid for Mean Sophia's modest purchase price and handled a few other expenses. When the gates broke, jockey Agustin Gomez hustled Mean Sophia to the front and put an insurmountable lead over their rivals by the time they hit the turn. A five-length advantage at the top of the stretch drew out to 10 1/2 lengths when they hit the wire, at odds of 13-1. Breezing an eighth of a mile alone in pristine conditions can only tell one so much about a horse's fortitude. Mean Sophia had proven she could stare down competition on a big stage and leave them gasping for air. Goebel said the offers to buy the filly came immediately. The first one came when the horse had barely been untacked. After hearing overtures from numerous contenders, Goebel and Gorostieta decided to enter Mean Sophia in the Keeneland April sale the day following her breakout performance and let the buyers decide things for themselves. At this point, just about anything Mean Sophia does will be playing with house money for the 23-year-old Goebel. A native of Evansville, Ind., Goebel entered horse racing at age 15 through her trainer ex-stepmother, working for her on weekends and during the summer. She started exercise riding for her a year later and eventually went to gallop for western Kentucky-based trainer John Hancock, who has himself become a staple of Keeneland's April 2-year-old races. Under Hancock's tutelage, Goebel took 14 mounts as an apprentice jockey in 2014 and 2015 before deciding to focus her energies elsewhere in the business. She moved to Lexington, Ky., last fall. Mean Sophia came into the picture when Gorostieta was contacted by a bloodstock agent who purchased the Calumet Farm-bred filly as a weanling for $3,700 at the 2017 Keeneland November Breeding Stock Sale. The trainer wasn't sold on the filly, but Goebel saw something she could work with and bought her privately. The filly's attitude might seem like a simple explanation for her name but Goebel said the decision was a family affair. “When I moved down here from Evansville, my sister was very, very upset,” Goebel said. “She's only 13, and I used to take her everywhere, so I told her, 'I'm going to name a horse after you.' She told me it'd better be a bay because that's her favorite color, so I picked a bay. Though the name is rather threatening, Goebel said the equine Mean Sophia mellowed out quite a bit once she got to work. For a horse with so many obvious sentimental ties, Goebel said the decision to enter Mean Sophia into the Keeneland April sale wasn't a hard one to make. She and Gorostieta will consign the filly themselves under the C.G. Racing Stables shingle, and she'll go through the ring on Tuesday as Hip 95. This entry was posted in Bloodstock, NL Article and tagged bob elliston, C.G. Racing Stable, Cirilo Gorostieta, horse auctions, Horse Racing, Keeneland, Keeneland April 2-year-olds in training and horses of racing age sale, Mean Sophia by Joe Nevills. Bookmark the permalink.